What is the most valuable and least valuable item in each pokemon game? This includes spin-offs and stuff. Also prefer if you put from oldest to newest games. Do you mean most awesome and sucky items or monetary values?? wouldn't sucky be something like a potion? Gen 2: Nothing that trumps the Nugget, so Slowpoke Tail and Star Piece come in at 4900, but Metal Powder and BrightPowder can be sold for 5. Gen 3: No new valuable items that could be sold were introduced. Nothing trumps the Powders, but the Lucky Punch can be sold for 5. Gen 4: Rare Bone ties with Nugget at 5000. All the items from before, but Quick Powder shows up, also with 5. Gen 5: I'll handle this one differently. 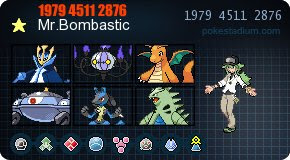 Route 5 maid: BalmMushroom for 25000, any berries not listed here for 20: Lansat, Starf, Enigma, Micle, Custap, Jaboca, Rowap, Razz, Bluk, Nanab, Wepear, Pinap, Cornn, Magost, Rabuta, Nomel, Spelon, Pamtre, Watmel, Durin and Belue. Icirrus City man in Pokemon Center: Comet Shard for 60000, and I can't find a cheapest but I have sold gems for 50. Undella Town man: Relic Crown for 300000, and Relic Copper for 1000. Red/Blue: You can't get any lower than 1... Apple, Big Apple, Grimy Food, Chestnut, and Plain Seed. Explorers of Time/Darkness/Sky: Everything in the previous list, + Nectar. There are no items in any of the games!!! so you mean spinoffs like mystery dungeon? can you name the ones you want me to do? mystery dungeon, and pokemon ranger. Sorry if I took a while to answer it! Metal/Quick/BrightPowder can only be sold for 5 at Pokémarts. lol, how did I miss those?! Edit:Also Master Balls are valuable because you find them only 1 time and they can catch any pokemon without fail. Mails can be sold for 25 poke dollars so they are the least valuable item. Master balls cannot be sold, much like Moon Stone and Key Items.